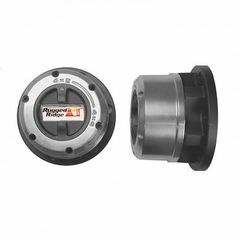 This pair of manual locking hubs from Rugged Ridge fit the 30-spline Dana 50 & Dana 60 front axle used in 76-04 Chevy, Dodge, and Ford trucks. Are you looking to replace your manual locking hubs? Rugged Ridge has you covered with this pair of OE replacement manual locking hubs that fit the 30-spline Dana 50 & Dana 60 front axle shafts in 76-90 1-ton Chevy trucks, 90-93 3/4 ton & 1-ton Dodge trucks, 78-97 3/4 & 1-ton Ford trucks, and 99-04 Ford Super Duty Pickups/Excursions.